Saturday, August 29, 2015-A capacity crowd was on hand to roar the riders to victory at the 2015 Helotes Festival Association Bull Blowout. With $5,000.00 in added money the cowboy competition was top notch and the bucking stock was just as stout. Thirty-nine riders from all parts national and international showed up to climb on a “rank one” and try to get a share of the $7,925.00 total payout. In the end, National Finals Rodeo Qualifier-Cooper Davis, marked the high point ride with 84.5 points to capture first place money and the championship buckle. Close behind, with a score of 84 points, Jorge Valdivieso, worked his way to the second place finish. The field of “paying places” was rounded out by rides by Clayton Bathe (79.5 pts), Lane Nobles (79 pts) and Kevin Weston (75 pts). 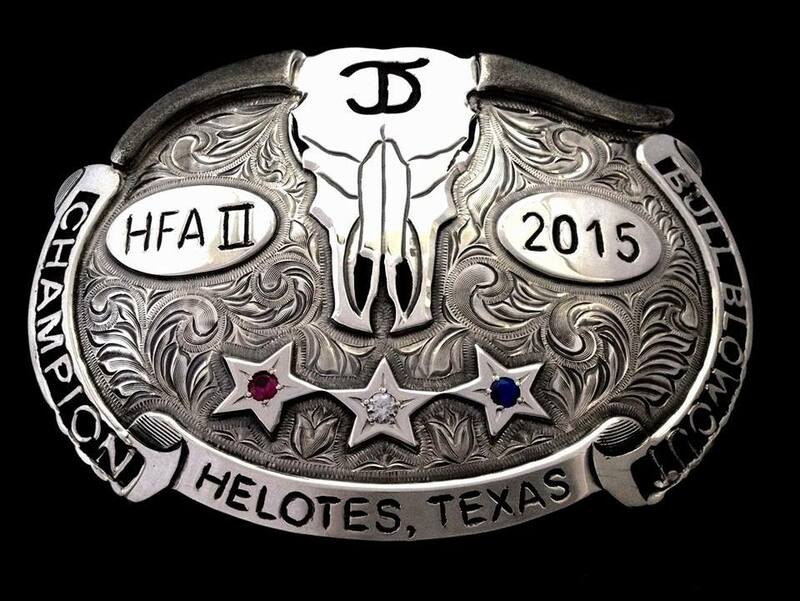 Championship Buckle by Shayne Beckham’s SB Western Silver. This entry was posted in Bull Riding and tagged bull, Bull Riding, clayton baethge, cooper davis, cornyval, covenant, covenant rodeo livestock, f and f bucking bulls, helotes, jd nix, neil holmes, PBR, rank, Rodeo, ronnie kitchens. Bookmark the permalink.